Oath (page 131) - hilarious; Gruesome I found on page 442 under Worst Pregnancy - yuck! 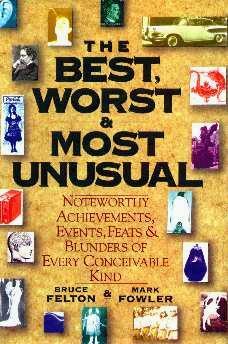 ; Worst Wine (page 226) - Muktuk...; Worst Editing of a Film (page 45) - very funny; Best Rock Song (page 53) - "Sergeant Pepper's Lonely Hearts Club Band is still the best rock album ever released" is their finding - many would disagree; Best Currency (page 477) - bizarrely funny; Best Taxi Drivers (page 544) - London has the best - read all about it! ; Best Fan (page 354) - poor guy, and Most Unusual Beads (page 257) - squid eyes? This book is tongue-in-cheek and you're left to your own devices whether or not all is fact or not. You can have a good laugh, sneer, chuckle in agreement, or enjoy a whimsical trip through a huge amount of useless information. You'll never be short of "facts" to throw about at parties. Some of the topics are Fine Arts, Drama, The Movies, Pop Culture, Government, Religion, Nature and Science, Consumer Products, People, and Places. Conclusion - Not as great as I thought it would be - it's too dated.